About 3 weeks ago, I mentioned the importance of letting your children to play on their own – without parents’ interference and involvement – in this article. This article is a follow-up to it. “Why second article on the same topic?” you ask. I am not telling you this to impress you how clever my children are. Nor do I want to ask you to follow what my children had done. However, I just want to stress a point that if we let our children have the freedom to come up with their own play ideas (or just anything for that matter), they can do wonders. In other words, let them crack their head and do their best to come up with ideas with only things they have on hand. This happened two weeks ago – the first week of year-end school holidays. While I was working, J and K told me to stay in the room until they told me I could come out of the room. After a few minutes, they were done with what they were up to and asked me to step out with my eyes closed. They wanted to show me their work and hopefully it would give me a surprise. They did. I was indeed surprised yet again. They had set up a simple restaurant with three tables. 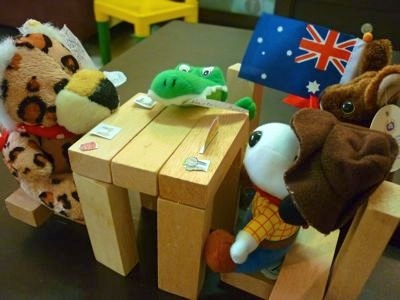 With small soft toys as waiters and customers. Everything started with Jenga blocks. J began the “project” by creating the first chair. Things really got off the ground when they built from one thing to another: chairs, tables, menus, waiters, customers. The final part was to arrange all these items according to the setting of a restaurant. That’s not all. To make things more real, J thought of the idea to include meals on table (food sketches on paper) and the normal conversation (reflected as bubble – as what we usually see in comic books) a restaurant would have. 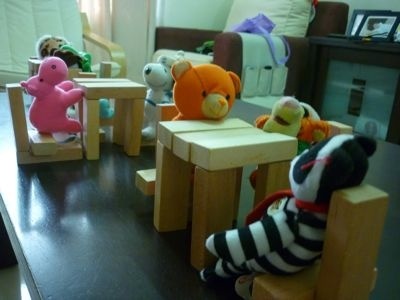 To expand the restaurant, the kids added more tables, chairs, and customers by using another set of toys – which originally were not meant for this purpose. 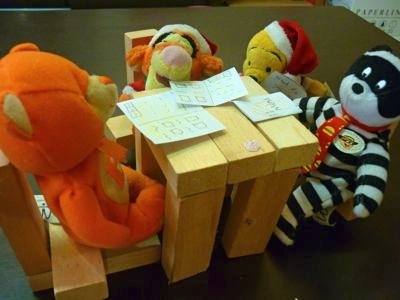 They found new ways of playing with the toys. It is amazing to realize how creative children can be if they are given the space to express themselves. Before you can see the results, first you have to let them have the independence to find innovative ways of playing a toy or thing.